Rain Barrel Soaker Hose can be identified by it's purple stripe. It uses the same 580 OD fittings as the "yellow stripe" 3/8" soaker hose. Rain Barrel Soaker Hose can be used as a gravity drip irrigation system as it performs well with no pressure in lengths from 50' to 75'. When using Rain Barrel Soaker Hose, a good tip would be anytime you can create a "Loop" do it! 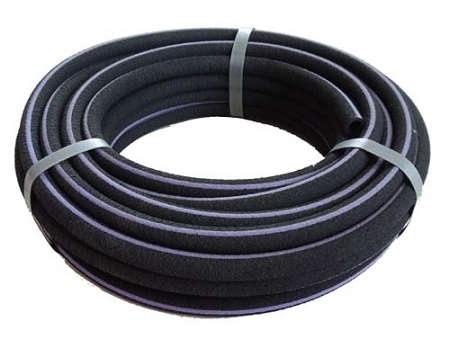 This will give you better uniformity in hose performance. Flow rates will vary, depending on the size of your water container and the elevation of it. DO NOT connect Rain Barrel Soaker Hose to a faucet, this may cause spraying and damage to the hose. ALWAYS use a 200 mesh stainless steel filter to help prevent clogging. No regulator is required, nor is a backflow preventer, or flow disc.